The birth of mortgage-backed securities didn’t change just Wall Street. It changed the mortgage business on Main Street too. Mortgage origination — that is, the act of making a loan to someone who wants to buy a home — had always been the province of the banks and the S&Ls, which relied on savings and checking accounts to fund the loans. Securitization mooted that business model. Instead, securitization itself became the essential form of funding. Which meant, in turn, that all kinds of new mortgage companies could be formed — companies that competed with banks and S&Ls for mortgage customers, yet operated outside the banking system and were therefore largely unregulated. Not surprisingly, these new companies were run by men who were worlds apart from the local businessmen who ran the nation’s S&Ls and banks. They were hard-charging, entrepreneurial, and intensely ambitious — natural salesmen who found in the changing mortgage market a way to make their mark in American business. Some of them may have genuinely cared about putting people in homes. All of them cared about getting rich. None of them remotely resembled George Bailey. 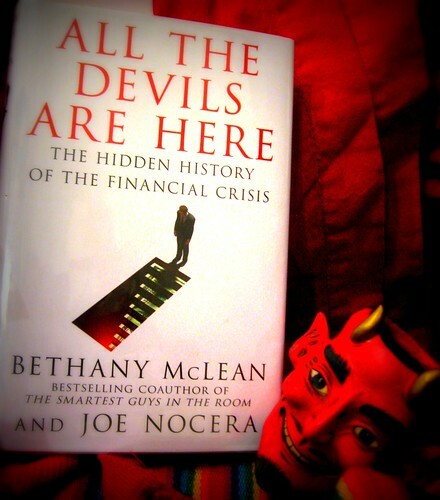 "Bethany McLean and Joe Nocera methodically reconstruct the 30 years that culminated in the Great Recession, years in which Wall Street's relentless greed and Washington's delusional regulators jointly built a time bomb - and thwarted any attempt to disarm it.... The depth of reporting is enormous." "Not for a page do the authors let any political theory or party off the hook as they deftly weave arguments, refutations and facts upon facts in this gripping account." "All the Devils Are Here is the best business book of 2010.... They put numbers and nuances into a human drama and wrote a business book that is as riveting as an adventure novel. I thought the financial crisis had been completely covered with great books by great writers and there wasn't anything else left to say. McLean and Nocera were able to build on the story and trace the crisis back, 30 years ago, to its roots." "Veteran journalists Bethany McLean and Joe Nocera slam dunk this difficult project. The authors turn CDOs into something that makes sense, CEOs into the fallible humans they are, and even transform the government into a place readers can picture.... I followed the financial crisis while it was happening, and frankly always felt like pieces were missing. The books that I read after the financial crisis covered certain bits in detail, but I still had no bird's-eye view. Finally, All the Devils Are Here provided it." "The authors succeed in pulling the jumbled pieces of the financial crisis together and showing how it flowed from human foibles." "Two of our finest business journalists have written a thorough account of the origins of the financial crisis. More than offering just a backward look, it helps explain the most troubling business headlines of the moment, as well as those that are certain to come."